Trade will happen with or without trade agreements, but with the signing of CETA, the EU and Canada are showing the way forward in shaping globalisation, writes Cecilia Malmström. Cecilia Malmström is EU Commissioner for Trade. So the day is finally here. Today, we are signing the Comprehensive Economic and Trade agreement at the summit between the EU and Canada. This agreement is an important achievement, for many reasons. First of all, it clearly demonstrates that when Europe comes together, we can shape globalisation according to our values and our standards. We reached an agreement on the EU side after some tumultuous discussions. Sometimes we need to make things a bit complicated first, in order to make them better as a result – it has always been the crises that foster progress in our European Union. There is much scepticism about both globalisation and trade these days – across Europe as well as in North America and elsewhere. In recent years we have been engaged in a very passionate European debate on trade. This is important, because it helps us improve our EU trade policy. As a Swede, I know for a fact that openness to trade and stringent social standards are not mutually exclusive. On the contrary – we need open and fair rules on trade to support, maintain and improve our welfare states. Trade agreements are not the silver bullet to solve all our problems, but it is an important tool that Europe has at its disposal to strengthen economic growth and foster jobs. It is clear to all that globalisation does put pressure on parts of our societies. We then have two options: we can take an easier path and pretend that we can reverse the tide of globalisation, closing our doors to the world. Or we can take the more difficult path and try to shape globalisation according to our vision, while having honest and difficult conversations at home. In signing today’s trade agreement, the EU and Canada opted for the latter, and I’m proud of that. With CETA, we clearly demonstrate the improvements we have made to our trade policy. For instance, we have the most ambitious sustainable development chapter ever negotiated, making clear commitments on social and environmental issues, and working together to improve these standards worldwide. We have heard many concerns across Europe about investment protection, and together with my Canadian counterpart Chrystia Freeland we have worked hard to replace the old ISDS with the Investment Court System, and committing ourselves to further refining this vital reform. CETA – full text here – will also bring very concrete economic benefits for European workers, farmers and consumers. Thanks to CETA, European companies will benefit from better access to the Canadian market than companies from other countries. European manufacturers will save over €500 million a year in scrapped tariff costs – that means better conditions for many small and medium-sized companies, from tie makers in Italy to producers of German machinery and many others. Trade simply works, and we know it from experience. When we get rid of unnecessary costs and overlapping bureaucracy, companies will try out new markets and hire more people. I am also very pleased that Canada has opened its market further by agreeing to provide extra protection to 143 so-called ‘Geographical indications’ – specialty food and drink products linked to the regions where the products are made, like Roquefort cheese or Schwartzwälder Schinken. Under CETA, only the genuine article can be sold in Canada under those names. There are more examples of benefits. Thanks to easier trade in services and the opening of procurement processes, European dredging companies will be able to bring their state-of-the-art technology to help ensure Canadian waterways are always navigable – opportunities that were closed to them before. And thanks to CETA, it will be easier for company employees and professionals to move across the Atlantic. Indeed, beyond just strengthening our trade relationship, we are now building a bridge to one of our closest allies. Canada shares our values on issues such as labour rights, environmental protection and fighting climate change. Setting new, high standards for trade with Canada will help us to motivate other trading partners to follow this ambitious and progressive model. We live in an interconnected world. Trade will happen with or without trade agreements. But by signing a progressive, gold-standard trade deal that upholds our ideals and sets a new model for international commerce, we are demonstrating how to shape globalisation. The EU and Canada are showing the way forward. The European Parliament now needs to give its backing to CETA in order for it to enter into force provisionally. The provisional application will not cover investment protection. This op-ed was first published as a blog entry on Malmstöm’s Commission page. Doesn’t see mean the unelected European Politburo will, after all another EU vote just means another chance for Juncker & his gang to threaten people. There are many people in the European Union that do not like this agreement and for obvious reasons. It is a charter for big business over countries and people. It allows big businesses to sue countries in Unequal Conditions of Contract that will deal with one issue after another and prevent logic taking hold. It allows GENETICALLY MODIFIED ORGANISMS into the EU in foods and meats. It allows HORMONES and PARALLEL ORGANISMS to be introduced into the EU in foods and meats. ..It allows BOVINE SUMATA TROPHIN HEAVILY DOSED HORMONE TREATED COWS MILK to be introduced into the EU without any notification that it has been used in an industrial scale in cows to produce massive quantities of unwanted milk which we do not need at all. ..It allows HORMONE DOSED BEEF HEAVILY DOSED IN CATTLE to be introduced into the EU without any notification that it has been used in cattle in industrial scale quantities which we do not want. ..It allows HORMONE DOSED PIGS–PORK– to be brought to the EU without any notification that it has been used in pigs. ..It allows HORMONE DOSED LAMB to be introduced and brought to the EU without any notification that it has been used in sheep. ..It allows HORMONE DOSED CHICKENS and TURKEYS to be introduced and brought in to the EU without notification that it has been used in Fowl. ..It allows HORMONE DOSED WHEET AND OTHER FOODS to be introduced and brought in to the EU without notification that it is so treated. It allows BSE [BOVINE SPONGIFORM ENCEPHELOPHAGY] WHICH IS RIFE ACROSS NORTH AMERICA to enter the food chain through imports to the EU. It allows the BYPASSING OF EU FOOD HEALTH AND HYGIENE ISSUES BY CANADA (AND ITS MASTERS THE USA) SO OVER-RIDING ANY EXISTING BETTER SYSTEMS ALREADY IN PLACE. It bypasses the ORGANIC FOOD REGULATIONS ALTOGETHER thus ELIMINATING ALL AND EVERY OPPORTUNITY TO MAKE ORGANIC FROODS IN THE EU. AND THESE ARE THE FOOD ISSUES WHICH CANNOT BE ARGUED AGAINST BY ANY STATE. The EU couldn’t shape a damned snowball never mind a trade agreement. What did the Wallonians get for their surrender 30 pieces of silver and whose bank did it get paid into? 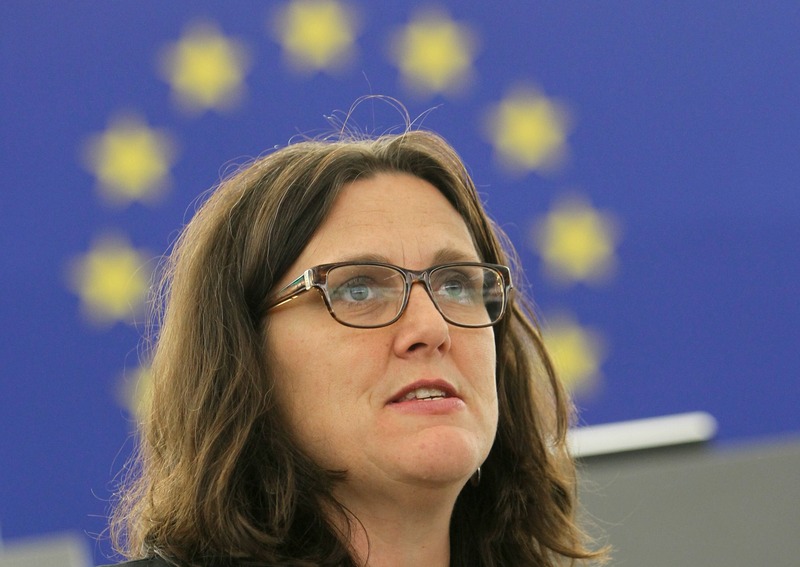 The EU is in the hands of UTTER FOOLS like CECILIA MALMSTROM , to whom engrandisment of the EU image globally is of greater importance than creating a simple European Europe that the people want . The EU is in a similar sinking boat as the US , both fighting for survival . The US is constrained to create war the world over to further its arms trade . The EU likewise is in danger of economic collapse and CETA/TTIP is clutching at straws to stay afloat .